iFixit has followed up on its teardown of the new Apple iPad with an analysis of the chips inside. 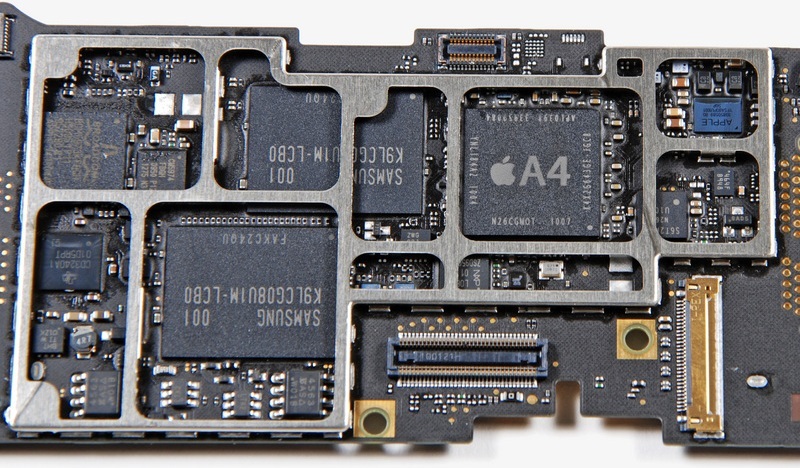 The Apple A4 CPU inside is a “package on package” design, with 256MB of Samsung SDRAM stacked right on top of the CPU, providing some benefits for both latency and power consumption. The CPU is most likely an ARM Cortex A8 design, paired with a PowerVR SGX 535 GPU– meaning that the iPad’s internals are identical to the iPhone 3GS’, except for a jump in CPU clock speed from 600 MHz to 1 GHz. Anand compared the iPad to Google’s 1 GHz Snapdragon-powered Nexus One phone, finding the iPad was quicker in some tests. However, the two devices were running different operating systems and the iPad has a much larger battery (which may allow for Apple to more aggressively push performance over battery life), thus limiting the usefulness of the comparison. For more information on Cortex A8, Snapdragon, and other mobile chipsets, check out the TechAutos Smartphone Processor Guide.